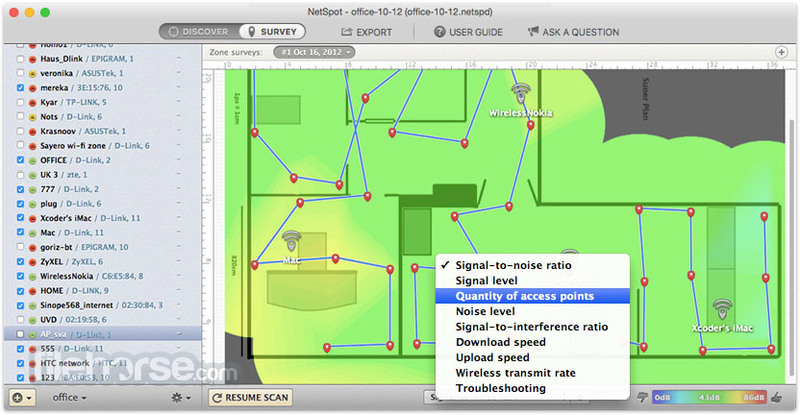 NetSpot for Mac is a comprehensive wireless survey tool for Mac users, which allows collecting, visualizing and analyzing Wi-Fi data using any MacBook. In just a couple of clicks you can load your area map, point to your location on the map and start collecting Wi-Fi data around you. 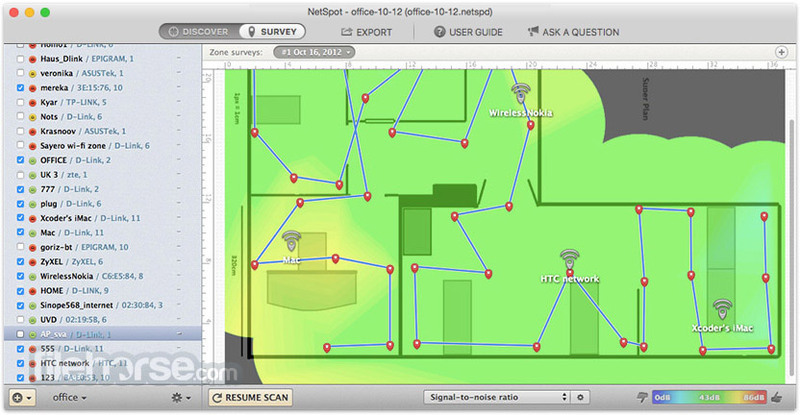 NetSpot for Mac creates heatmaps of your wireless network, showing you dead zones without coverage, so that you can place hotspots (Access Points) correctly. Using the visualized map of collected wireless data, you can also see channel overlap, which will help you to optimize your Wi-Fi network. WLAN site survey software has always been something for experts only. NetSpot changes that today! 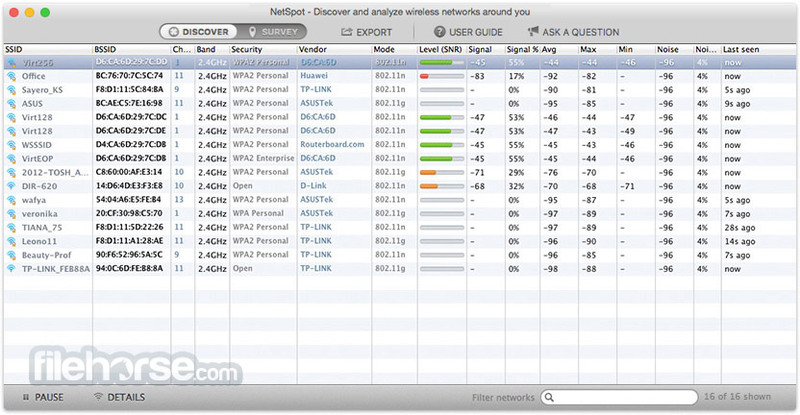 NetSpot wireless survey tool is really simple and accessible to Mac users of all levels. Simple deployment, no need for specific hardware, runs on any MacBook with Mac OS X 10.6+... it's a breeze to use. 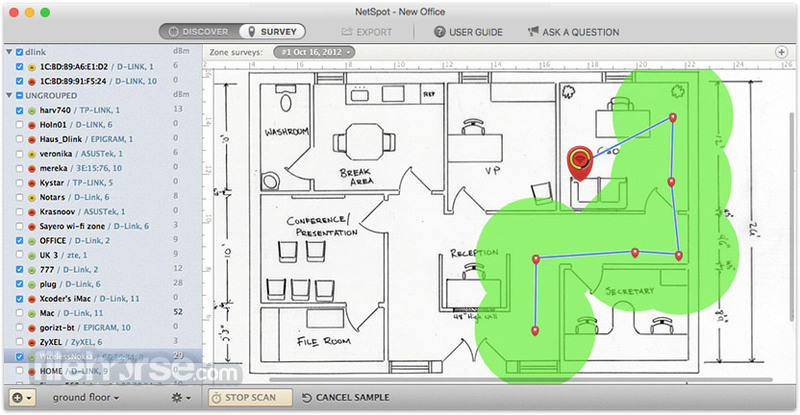 NetSpot is always up-to-date and is really small in size, only ~3MB to download, it brings the power of professional wireless survey software into your house, office or campus. Runs on a standard MacBook. Uses standard 802.11a/b/g/n wireless network adapters. Actually free! Note: Requires 64-bit processor. Some features like active scanning, professional visualization and advanced network management are disabled.